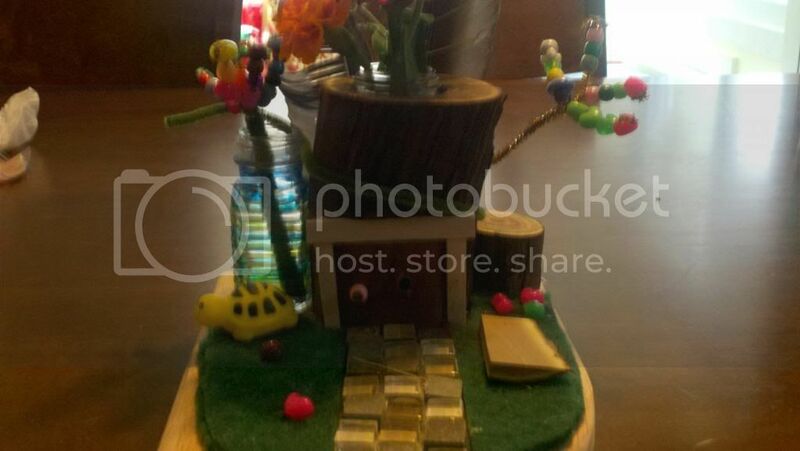 Mark the Fiddler's fairy door inspired this one for me. I was trying to find some creative way for my 6 year old son to make a gift for his mom for her birthday. A teeny bit of backstory. I make up stories every night at bedtime for my boys and the younger one gets “Larry Stories” Larry is one of 10 garden gnomes who help protect our yard and keep the garden and yard looking nice. A recent story involved myself and my son as well as all the garden gnomes getting trapped by some evil midget trolls and their crow minions. Momma came out just in time to call the fairies (they were a new addition to the storyline) and they came in and rescued us, and we proceeded to dispatch the enemies, followed by a pizza party around a bonfire (very abbreviated version). 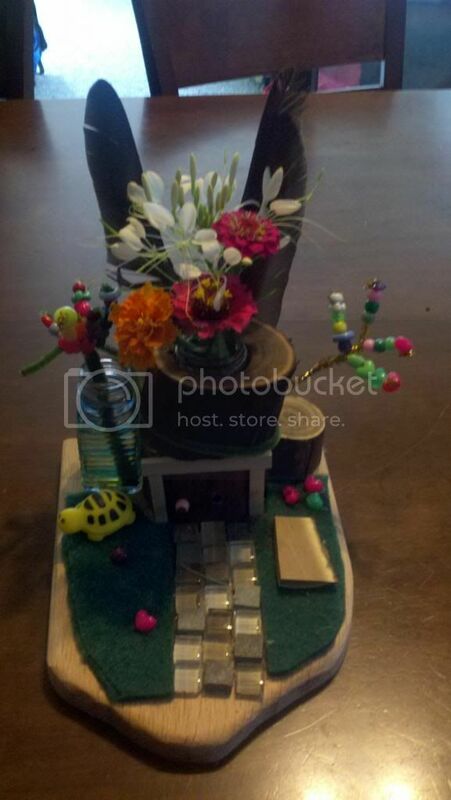 The next day I saw Mark’s fairy door and it was perfect inspiration, which I proposed to my son. He dove into the project with gusto and the results are pictured here. I did the sharp work and hot glue part while he picked design and decoration. 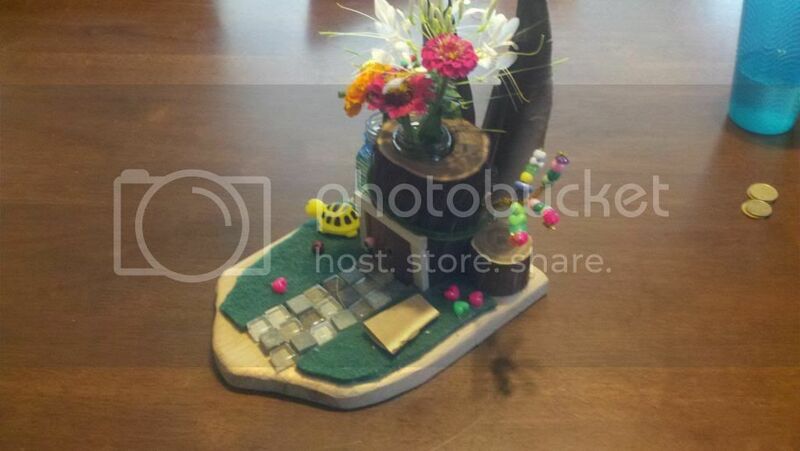 The base is a piece of red oak, the log stump thing is a piece of Russian olive I think, the door is cherry, the frame of the door is maple (gotta love the little scraps bin), the flowers are from our garden, some pipe cleaners and beads, an old spice bottle I used for screws was repurposed and put in the hole I bored in the center of the log, and some nice little glass vase my wife had picked up from a garage sale hot glued on the side(yeah I swiped it from her). Not a very fancy project but I had to post it because Mark’s post was a great idea that my wife loves! My son also proceeded to tell my wife the story after he gave her her gift. I thought she would relegate it to some corner in the sun room, but she wants it on the kitchen table where she always keeps fresh cut flowers. Thanks Markthefiddler!!!! That is one happy mama, and rightly so. I’m so glad your wife loved it. How could you miss though? Your son poured himself into it and that makes it a perfect gift. Father and son projects give back in every way imaginable. Happy Birthday to your wife! Awesome Job to your son. Well done Dad to you. And for the small idea at the right time, I humbly say ‘you’re welcome’.